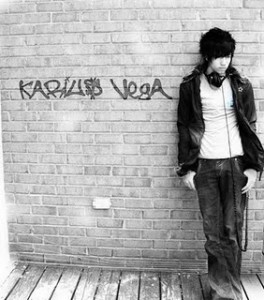 Driving industrial rhythms, highly dynamic progressions, and a hint of elegance are only a few ways to describe music by Karius Vega. His ranges from hard dNb, spontaneous IDM, zone out chill out, and ambient, down tempo, and heart felt emotion. Some of his music emphasize entirely on color, using colors coupled with intensities to create gradient progressions and a smooth, seamless feel, while being completely segmented. Great for chilling out, dancing, driving, and experiencing an escape. The beginnings of his career started in the studio. His passion for music production began as early as 12 years old, when he first started experimenting with mixing electronica and dance. He said he loved the immediate sense of control he had when mixing and editing in the comfort of a studio, but never quite thought of being a live dj. His styles have already diversified; his major styles now include IDM and drum and bass instead of predominantly electronica. “The purpose of my ENCO mix was to get as much feedback as possible, Vega said. “Without my fans’ feedback, I can’t improve myself or accentuate the impact I have on the music scene.” He reiterated that his fans have offered a significant amount of feedback, and for that he was thankful. He said to him, music was a bit like research. It was an ongoing process of refining himself and his music while trying to define his persona. He said his hope is to create musical history. He said he had high hopes for all the shows to come, and that he was in a constant state of perfecting his mixes. His recent and seemingly effortless success as a live dj seemed to take him a bit by surprise, but his humility stayed constant.